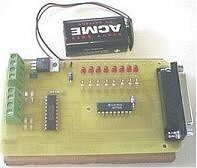 This was the first of the interface boards developed in conjunction with members of the Educational Computing Association of Western Australia (ECAWA). This board follows on from the "Simplified Output Interface". We wanted to be able to experiment with the input lines using a battery powered interface. Everything has been compacted to keep the board costs to a minimum. You can use a nine volt battery for normal use. (The diode connected to the negative terminal will protect the 7805 voltage regulator against reverse polarity.) If you want to try driving stepper motors you will need to use a 12 volt supply able to deliver at least one amp. The supply should be regulated!! If you wanted to, you could connect a small DC electric ("hobby") motor directly across an output line. As long as the total current drawn through the ULN2803 was less than one amp you should have no problems. PCB Artwork for the Simplified I/O Interface. Schematic of the ULN2803 Integrated Circuit showing detail for one driver line. The Simplified I/O Interface electronic circuit. PC related electronic circuits and schematics.